For the first time ever Korea will play on the Olympic stage with men’s and women’s ice hockey teams. The 25-man roster for the 2018 Olympic men’s ice hockey tournament is now set. The team in PyeongChang 2018 will look similar to the one that historically earned promotion to the top division of the 2018 IIHF Ice Hockey World Championship last spring by surprising the world at the 2017 IIHF Ice Hockey World Championship Division I Group A in Ukraine where it left countries like Kazakhstan, Hungary and Poland behind. 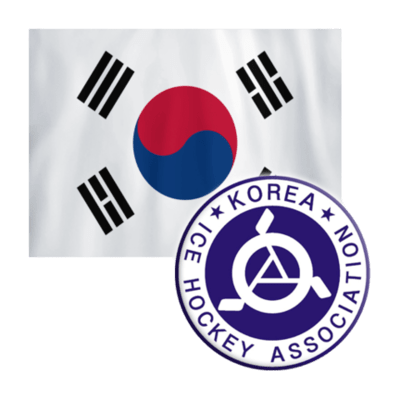 All players will join from Korea’s three Asia League teams Anyang Halla, High1 and Daemyung as well as from Sangmu and will be led by two Korean-born former NHLers, head coach Jim Paek and assistant coach Richard Park. With the bigger roster size than last spring in Ukraine several more players will be on the team including Brock Radunske and Mike Testwuide, who missed out on the last tournament, but also two players who have never played an IIHF event with the men’s senior national team before, defenceman Hyung Gon Cho and forward Jung Woo Jeon, with 23 years one of the youngest player on an otherwise experience squad. Only 22-year-old defenceman Yeongjun Seo is younger. 34-year-old Radunske is the oldest player on the roster. Kisung Kim has been the longest with the national team having represented the Korean men’s national team in 13 IIHF Ice Hockey World Championship tournaments, Woosang Park played in 11. Seven players on the roster have their roots in North America but have become Korean citizens after playing for Asia League teams from the country for several years. Goaltender Matt Dalton, defencemen Alex Plante, Eric Regan and Bryan Young, and forwards Brock Radunske and Michael Swift are originally from Canada, forward Mike Testwuide from the Untied States. Radunske, nicknamed “Canadian Big Beauty”, spent most time in Korea having joined his club Anyang Halla in 2008. The team in PyeongChang 2018 will be the strongest line-up ever and also includes the team’s best scorers from the recent World Championship Division I including Jin Hui Ahn, who had two goals and five points in five games, Kisung Kim (3+1=4), Sangwook Kim (1+3=4) and Swift (1+3=4). Swift is currently also the scoring leader of the Asia League with 14 goals and 42 points. Athletes from the north and south of the Korean peninsula will walk under the unification flag at the opening ceremony of the 2018 Olympic Winter Games not for the first time. But for the first time ever in Olympic history athletes from the two Korea’s will compete together as a team in an Olympic event at the 2018 Olympic women’s ice hockey tournament. To make this ambition with a short preparation time come true, 12 players from the Democratic People’s Republic of Korea (commonly known as “North Korea”) crossed on Thursday the normally closed border to join the 23 players of the Republic of Korea (“South Korea”) earlier than other athletes from the north and form a unified team. According to the agreement between the two countries and the IOC and IIHF for this ambitious project, 22 players will be selected for each of the games from the exceptionally big tournament roster and at least three North Koreans will play in each game. Ten months earlier at the 2017 IIHF Ice Hockey Women’s World Championship Division II Group A at the Olympic ice arenas in Gangneung, the two countries competed in the same division that served as a test event. Just crossing the border to compete was already historic considering that the inner-Korean border forms one of the biggest political divides. But after the game the two teams came together for a historic joint team photo to celebrate the International Day of Sport for Development and Peace on 6 April 2017. It was much more important for the 5,800 fans in attendance than the result – the southern team edged their northern rivals 3-0. It was also thanks to that gesture that the idea of a joint team was born when the governments of the two Korea’s discussed sending North Korean athletes to the Olympics in the south. And eventually came to an agreement with about four weeks left. The roster includes all 23 South Korean players who have already been preparing for the Olympics and have been together in a similar line-up for the past two years. That includes players like Do Hee Han, who was named the best goaltender of the tournament last year, or the scoring leader of that team, captain Jongah Park. The team improved during the last years by becoming centralized and being joined by Koreans who have learned their hockey abroad. Six players have two citizenship and for them the 2018 Olympics means discovering their Korean roots. One of the interesting story lines is Yoonjung Park, who recovered her Korean citizenship. She was born in Korea and adopted by an American family. In the U.S. she is better known under the name Melissa Brandt and her (non-Korean) sister Hannah Brandt will be competing at the tournament as well, but for Team USA. Last Thursday one goaltender, four defenders and seven forwards crossed the inner-Korean border to join their new colleagues in one of the most confidence-building measures between the two Koreas that are formally still in a state of ceasefire since the end of the Korean War in the 1950s. Also a coach, Chol Ho Pak, crossed the border and will join the team staff of the unified team that will compete under the unification flag and with a separate abbreviation (COR). The 12 players were all on the team that came to Gangneung last April in the 2017 IIHF Ice Hockey Women’s World Championship Division II Group A, just that this time they will compete together on one team and with the Korean peninsula on the jersey. Among them are the top-two forward lines including two players who made the top-20 scoring list at the event, Su Hyong Jong and Un Hyang Kim. Most of them have competed for the DPR Korea national team for many years and they are aged between 21 and 28. The 28-year-old is Ok Jin, who on Sunday got her birthday cake in South Korea and represented DPR Korea in six IIHF Ice Hockey Women’s World Championship events. The very youngest and oldest players on the unified team come from the south. Heewon Kim is just 16 and one of eight millennial’s on the team. Soojin Han is 30 and has represented the Republic of Korea in eight IIHF Ice Hockey Women’s World Championship events and two Asian Winter Games. Sarah Murray from Canada will serve as the head coach of this historic team. The daughter of former NHL, Team Canada head coach and IIHF Hall of Fame member Andy Murray came to Korea in 2014 to improve the national team program and prepare the players for the Olympics. She will have plenty of players to choose from, which will be a challenge at the same time. It’s 35 players who will compete in Group B against Sweden, Switzerland and Japan but who are also ambassadors of a historic sport and peace project in the not always easy relations between the two Korea’s.